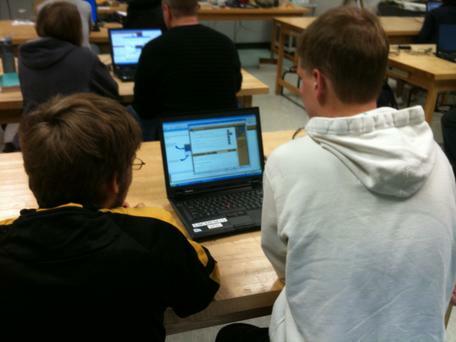 Students at Rochester Community and Technical College work on a web-based activity in class. Fall 2010. The contributing projects together have a wealth of materials available to help two-year college faculty improve student learning in the geosciences. Below, these materials have been organized along themes of special relevance to 2YC educators. The nature of two-year colleges means that the majority of courses offered are at the introductory level. Combine that with the importance of entry-level courses for science literacy and for getting students excited about geoscience as a major and two-year colleges become very important to the discipline, indeed. On the Cutting Edge has extensive resources on Teaching Introductory Geoscience Courses which provides a wide array of resources for teaching at the introductory level from motivating students to dealing with misconceptions as well as a discussion area where educators can interact and share ideas. There are also searchable collections of teaching activities and course descriptions submitted by faculty members at all kinds of institutions who teach introductory geoscience courses. You can also browse through the collection of course descriptions submitted by 2YC faculty. These course descriptions have come from various projects and range across the discipline. And if you have a course that you find particularly engaging for your students, you can add it to the collection. Teach the Earth Site Guides bring together materials developed by multiple projects to provide broad access to quality resources on particular topics. Here are a few that will be of particular interest. The full set of Site Guides is available at Teach the Earth. Geoscience Literacies: Over the last several years, there has been a concerted effort to to define key aspects of the geosciences in terms of the big ideas that need to be grasped by students, the public, and policy makers. This work has led to the development of literacy documents that summarize the most important principles and concepts across different parts of the geosciences. Originally envisioned as a way of helping educators implement the National Science Education Standards, the literacies are also valuable to other individuals and communities for better understanding the science that affects their lives. The mathematics preparation and quantitative skills of many colleges students are insufficient to master geoscience material, at two- and four-year colleges alike. Faculty are faced with needing to bring their students up to speed quantitatively in order to address the content they need to teach. Several projects are helping faculty address this challenge with tools and materials to enhance their students quantitative skills. The Math You Need, When You Need It: This project has created a series of online tutorials covering particular quantitative skills paired with how they are used in geoscience courses. The object of the tutorials is that a faculty member could assign students to complete one on a particular topic just before they would need to be able to use that skill in class and hopefully need to spend less time in class getting everyone up to speed. Teaching Quantitative Skills in the Geosciences: This website provides information on the issues involved in teaching quantitative literacy, reasoning, and skills and some methods for doing so as well as additional resources and a community of other faculty who are attempting this challenging task. Many geoscientists view teaching in the field as one of the cornerstones of our discipline. However, a variety of factors make this more difficult at two-year colleges than at four-year institutions. Our 2YC Students in the Field page presents perspectives and resources for engaging these students in fieldwork at several scales. Research experiences are essential to helping students develop an understanding of the scientific method and to engage them in critical thinking and problem solving skills. The On the Cutting Edge module on Undergraduate Research represents an aggregation of community knowledge, experience, and resources that can encourage and support undergraduate research across the geoscience curriculum. Of particular interest to two-year college faculty, there is help for integrating Inquiry and Discovery-based Projects into Intro Classes and a set of case studies at the introductory level for conducting research with students. Browse through the collection of teaching activities developed by two-year college faculty from around the country for use in their own teaching. These activities have been submitted by faculty members to a number of different projects on a variety of topics and this browse brings them all together. You can also share a teaching activity you find particularly effective at strengthening your students' understanding of geoscience. Explore the collection of essays by 2YC faculty about issues, challenges, and solutions in geoscience education at two-year colleges. These essays were contributed by faculty attending a variety of professional development workshops and speak to a range of topics.